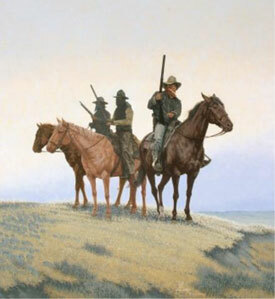 Travelers of the nineteenth century American West, faced many difficulties; winter's bitter cold, summer's heat and choking dust and wide expanses of desolate open country, where small bands of outlaws and desperadoes roamed at will, resulting in many a traveler losing his valuables to these bandits of the open road. This painting has been chosen by the Winchester Arms Collectors Association for the 2005 calendar. This is a limited edition of only 50 signed and numbered by the artist. The image size is 24" X 26". This print comes stretched on stretcher bars and is unframed. The price is $550.00. Please ask about our custom framing.